French President says he is ready to back sanctions against those responsible for murder of Saudi journalist Jamal Khashoggi. The French president "informed (King Salman) of his profound indignation at the crime and demanded that all possible light be shone on the circumstances that led to this drama", his office said in a statement quoted by AFP. Saudi Foreign Minister Adel al-Jubeir on Sunday said the killing at the Saudi consulate in Istanbul was not ordered by the Crown Prince and insisted that the kingdom did not know where Khashoggi’s body was. Macron told the Saudi king that France's main priority was "defending freedom of expression, freedom of the press and of the public. 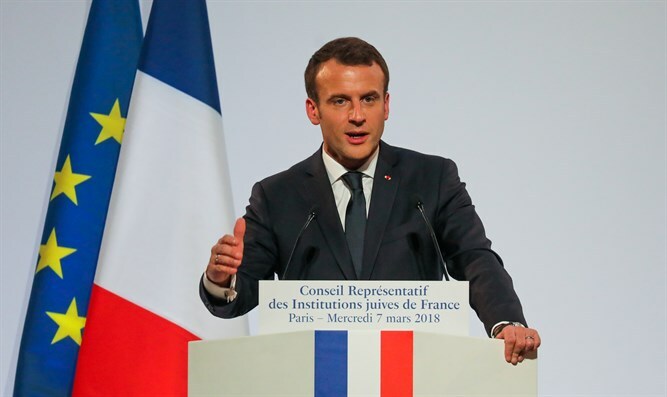 France will not hesitate to take international sanctions, together with its international partners, against the guilty", Wednesday’s statement said, according to AFP. The crown prince on Wednesday called the killing "repulsive". Western countries have demanded a thorough and transparent investigation. France said earlier Wednesday it would take "punitive measures" if Saudi Arabia is "proven" to be behind the murder.